Note that for the interaction between a triplet of atoms I,J,K, there is no “central” atom. 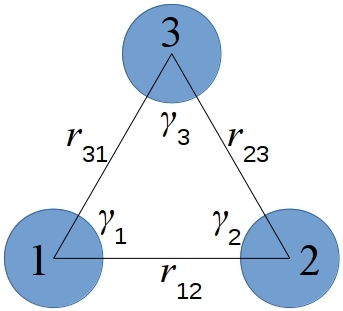 The interaction is symmetric with respect to permutation of the three atoms. Thus the nu value is the same for all those permutations of the atom types of I,J,K and needs to be specified only once, as discussed below. The atm potential is typically used in combination with a two-body potential using the pair_style hybrid/overlay command as in the example above. The potential for a triplet of atom is calculated only if all 3 distances r12, r23, r31 between the 3 atoms satisfy rIJ < cutoff. In addition, the product of the 3 distances r12*r23*r31 < cutoff_triple^3 is required, which excludes from calculation the triplets with small contribution to the interaction. K can be specified in one of two ways. An explicit numeric value can be used, as in the 2nd example above. J <= K is required. LAMMPS sets the coefficients for the other 5 symmetric interactions to the same values. E.g. if I = 1, J = 2, K = 3, then these 6 values are set to the specified nu: nu123, nu132, nu213, nu231, nu312, nu321. This enforces the symmetry discussed above. A wildcard asterisk can be used for K to set the coefficients for multiple triplets of atom types. This takes the form “*” or “*n” or “n*” or “m*n”. If N = the number of atom types, then an asterisk with no numeric values means all types from 1 to N. A leading asterisk means all types from 1 to n (inclusive). A trailing asterisk means all types from n to N (inclusive). A middle asterisk means all types from m to n (inclusive). Note that only type triplets with J <= K are considered; if asterisks imply type triplets where K < J, they are ignored. Note that for a simulation with a single atom type, only a single entry is required, e.g. By default the nu value for all triplets is set to 0.0. Thus it is not required to provide pair_coeff commands that enumerate triplet interactions for all K types. If some I,J,K combination is not specified, then there will be no 3-body ATM interactions for that combination and all its permutations. However, as with all pair styles, it is required to specify a pair_coeff command for all I,J combinations, else an error will result. This pair styles do not support the pair_modify mix, shift, table, and tail options. This pair style writes its information to binary restart files, so pair_style and pair_coeff commands do not need to be specified in an input script that reads a restart file. However, if the atm potential is used in combination with other potentials using the pair_style hybrid/overlay command then pair_coeff commands need to be re-specified in the restart input script. (Axilrod) Axilrod and Teller, J Chem Phys, 11, 299 (1943); Muto, Nippon Sugaku-Buturigakkwaishi 17, 629 (1943).